I spent a few hours photographing this beautiful bird east of Calgary near Delacour. The temperature, and the wind chill, conspired to make it a bit uncomfortable for me. Not so for the owl, he appeared to take the cold with little interruption to normal operations. He perched atop telephone poles and fence posts for long periods broken up by several flights low over the fields. Three of those were successful hunts. This image was from one of the scouting flights as he climbed towards a high perch. I liked the interesting shape of his profile and the soft details in the background of this image. This entry was posted on February 7, 2019 by Christopher Martin. 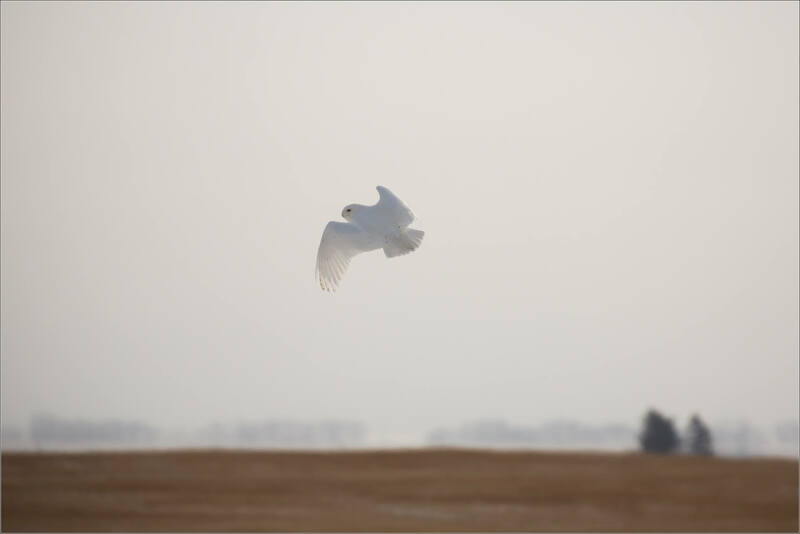 It was filed under Owls, Wildlife and was tagged with alberta, animals, bird in flight, Bubo scandiacus, Canada, flying, nature, owls, prairie, Snowy owl, wildlife, winter. Man owls are such cool birds. I always enjoy an owl encounter I just rarely ever see them! Usually, contrast is good, but I must say, this almost looks as though the bird has taken form from the snow/fog/mist surrounding it. It’s quite a striking photograph. Really beautiful! I have never seen one in the wild. From pictures I am seeing on different sights, it seems like we have an abundance of Snowies around. That is an impressive shot against the sky. With my eyesight the way it is , I would have missed it entirely so happy you captured and shared. So lovely! I’m also in Alberta.